To end the year, we're taking a look at the Best Android Devices of 2014 for gaming, everyday use, and battery life. With PCMark for Android, you can measure the battery life of smart phones and tablets for everyday tasks such as browsing the web, watching videos, working with text, and editing photos. This is a table we'll be watching closely in 2015 since seeing battery life (green bar) and performance (grey bar) side by side is an excellent way to judge a device's overall capabilities. 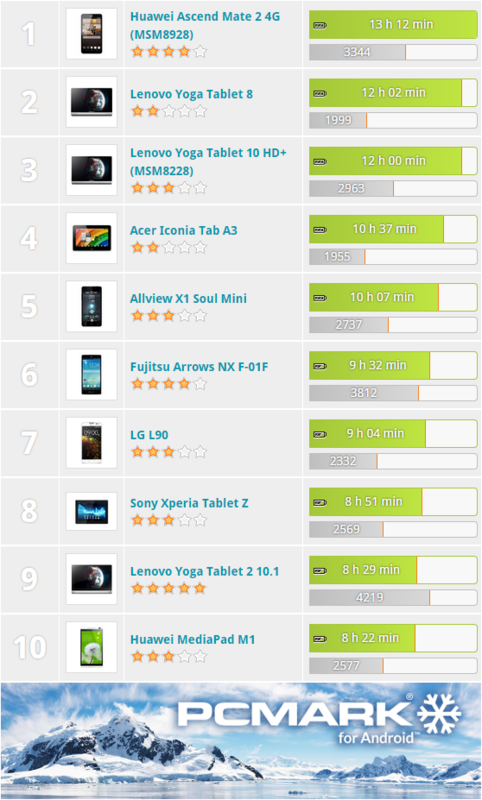 View the full list and compare the battery life of over 200 Android smart phones and tablets. PCMark for Android is a free Android benchmark app available from Google Play.